The Hydraquick range of quick release couplings is based on a proven design that has predominantly been used in the building services sector (amongst others) since 1988 and fitted in many prestigious buildings both in the UK and overseas either as part of original equipment or by M&E contractors. Manufactured from DZR Brass with a nickel plating (on external parts) for added surface protection, making it perfect for applications that may be prone to stress corrosion cracking (SCC), whilst the EPDM seals ensure maximum service life in LTHW & CHW heating or cooling applications. 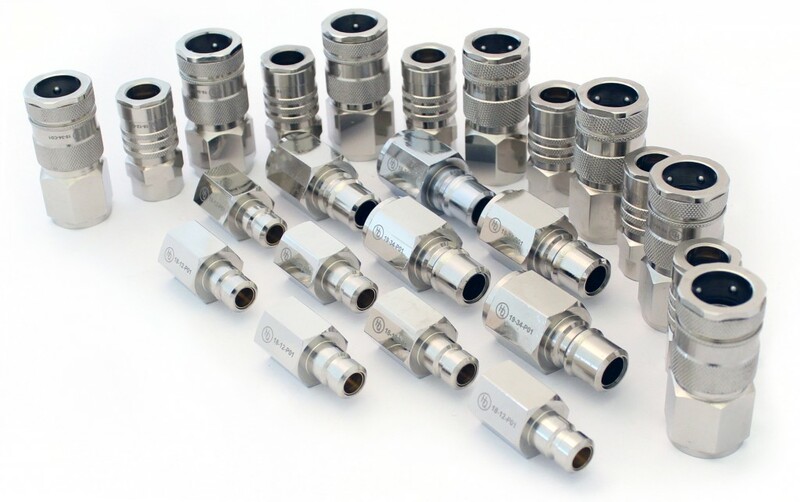 Stocked lines are tailored towards the requirements of the Building Service market with the HQ18 series available in ½” bspp female threaded connectors on the plug and the coupler. Similarly the HQ19 series are available in ¾” bspp female threaded on the plug and the coupler. These threads will suffice the majority of applications however they can be fitted with an appropriate adaptor if required. Both Series are available in other terminations – subject to minimum order quantities – with the HQ18 Series also available in 3/8” bsp and ¾” bsp. The HQ19 Series is available in both ½” bsp and 1” bsp. Subject to meeting the minimum order quantity, there are further options available include hose tails and bespoke design terminations. The HQ18 & HQ19 series range of quick release couplings are fitted with a shut off valve on both sides to provide an instant shut off and closure of the flow on disconnection with minimal spillage supported by a design feature that prevents leakage when connecting and disconnecting. Internally the profiled valve minimises (fluid) resistance ensuring maximum flow and minimal pressure loss. Suitable for numerous applications that are compatible with the materials of construction, with performance requirement of the application determining which series should be specified. Typical users include; H&V original equipment manufacturers, OEM’s of water transfer equipment and M&E Contractors. Click here for further technical information.